It gives me great pleasure to come to the beautiful city of Budapest and join you at the seventh China-CEEC Business Forum. On behalf of the Chinese government, I wish to extend warm congratulations on the opening of the Forum and pay high tribute to the people from various sectors who have devoted to the China-CEEC friendship and cooperation. “16+1” cooperation, which was jointly launched by China and CEE countries, is a pioneering endeavor of China-Europe friendly cooperation. In 2011, the first China-CEEC Business Forum was held in Budapest, setting “16+1” cooperation in motion. Thanks to the joint efforts of our governments and business communities, we have set up a well-structured framework and expanded the scope of our cooperation with fruitful outcomes. Cumulative investments by Chinese companies in the 16 CEE countries grew from nearly $3 billion in 2010 to more than $9 billion in 2016. Two-way trade rose from $43.9 billion to $58.7 billion. The CEEC’s agricultural exports to China surged more than 300 percent. And a total of 6,000 plus freight trains have traveled between China and European countries. A review of this remarkable course of “16+1” cooperation brings us to the following conclusions. First, being results-oriented is a defining feature of “16+1” cooperation. More than 200 specific cooperation measures have been rolled out in such key areas as trade, investment, connectivity, industrial capacity, finance, green economy and people-to-people exchange. In particular, several major initiatives have been pursued to leverage the geographical advantage of CEE countries. The Budapest-Belgrade railway, the China-Europe Land Sea Express Line and the Adriatic-Baltic-Black Sea Seaport Cooperation have all made initial progress. At each “16+1” summit, we as leaders would pay special attention to the views and appeals from the business communities and focus on tackling specific difficulties arising from our practical cooperation in an expeditious manner. The fact that the Business Forum has been held on the sidelines of the s ummit each year is, in itself, a reflection of the results-oriented nature of “16+1” cooperation. Second, “16+1” cooperation has been a business-led, government-supported and market-driven process. You, the entrepreneurs, are the sailors on board the big ship of “16+1” cooperation. You play a crucial role in enabling the ship to brave winds and waves. The government’s responsibility is to provide overall guidance, build institutions and platforms for cooperation, foster an enabling trade and investment environment by offering necessary policy support, and protect the lawful rights and interests of all companies. Our cooperation projects over the years, be they on industrial capacity or connectivity, have all followed commercial principles and internationally accepted rules. This has helped us to leverage our respective strengths and reap win-win outcomes. Third, “16+1” cooperation has been an important component of and beneficial complement to the overall China-Europe relationship. As a platform for trans-regional and practical cooperation, “16+1” cooperation has consistently followed the principle of openness and transparency and has been pursued in the broader context of China-Europe relations and in light of relevant EU laws and regulations. “16+1” cooperation is open to other countries and international organizations, who are welcome to participate in a tripartite format to advance the interests of all. Over the years, we have admitted six observers including the EU and Austria, and proactively engaged the Visegrad Group and other regional cooperation initiatives to open the door of our cooperation ever wider and bring benefits to ever more people. Past progress shows that rather than undercutting Europe’s overall interests, “16+1” cooperation has injected positive energy into the European integration process and contributed to the more even development of China-Europe relations. Fourth, “16+1” cooperation promises broad prospects. Enjoying a profound traditional friendship and a high level of mutual trust, China and CEE countries view each other as an important cooperation partner. Both our economies show a strong momentum of growth and possess respective comparative strengths in the market, resources, industry, technology and capital. Yet China-CEEC trade now accounts for only 11 percent of China-Europe trade, and our investment stock a mere 2 percent. Much potential remains to be tapped. In particular, progress in the building of the Belt and Road Initiative has presented “16+1” cooperation with unprecedented opportunities. In the past few years, we have been able to identify clear goals, institute the overall framework and lay a solid foundation for “16+1” cooperation. Going forward, we will further expand and upgrade “16+1” cooperation in light of the changing international landscape and the expectations of our business communities by introducing better-targeted policy measures to foster a freer and more open trade and investment environment. With the theme of “deepening economic, trade and financial cooperation for win-win development”, this forum aims to boost the twin engines of trade and finance to propel the ship of “16+1” cooperation forward in a steady and sustained way. — We need to forge greater synergy between the Belt and Road Initiative and the development strategies of CEE countries. As President Xi Jinping repeatedly underscored during meetings with leaders of CEE countries, “16+1” cooperation should serve as a major gateway in the further implementation of the Belt and Road Initiative in the European economic circle. China will work with CEE countries, in line with the principle of achieving shared growth through consultation and collaboration, to make the CEE region an early beneficiary of the outcomes of the Belt and Road Forum for International Cooperation. We need to speed up the building of the Budapest-Belgrade railway and other connectivity projects, work for the sound development of freight train services, expand international industrial capacity cooperation, and jointly build a number of economic and trade cooperation zones, with a view to developing better integrated chains of industry, of value and of logistics with stronger impetus and broader benefits. — We need to vigorously promote trade and investment liberalization and facilitation. Cooperation among customs authorities should be enhanced. Enterprises with a track record of compliance will be offered greater facilitation in terms of streamlined customs procedures, lower inspection rate, and speedy customs clearances to speed up logistics operations. In light of the need for a stronger mechanism for communication and coordination on inspection and quarantine, China will streamline inspection and quarantine access procedures to facilitate export of high-quality agricultural products such as meat, dairy products, honey and fruits from CEE countries to China. We will explore the possibility of setting up an e-commerce cooperation mechanism in support of cross-border e-commerce and foster new growth areas in trade. In 2018, China will host the first China International Import Expo in Shanghai, which is a major initiative and action by China to promote trade liberalization and open up its market to the world. CEEC companies are more than welcome to take part in the Expo, and China will provide you with assistance and facilitation. China encourages the setup of “16+1” economic and trade cooperation demonstration zones in Ningbo and other Chinese cities, which will serve as platforms for strengthening trade and investment cooperation, and a green channel, in particular, for CEEC exports to China. China has rolled out a foreign investment management model nationwide based on pre-establishment national treatment and negative list. We are ready to explore with CEE countries the opening of a green channel for investment cooperation, and hopes that CEE countries will provide Chinese investors with conveniences in visa and work permit applications. — We need to further expand financing channels. China supports commercial and development financial institutions in financing China-CEE cooperation projects and encourages RMB financing in these projects. We support CEEC companies in issuing Panda bonds in China. The China-CEE Fund launched by the Industrial and Commercial Bank of China in 2017 is well received by all sides as it has expanded the channels for market-based investment and financing. Hereby, I wish to announce two new measures in this area. First, the China-CEEC Inter-Bank Association is officially established today. The China Development Bank will provide two billion euros equivalent development finance facility. Second, the second stage of the China-CEEC Investment Cooperation Fund has been completed with a fresh capitalization of $1 billion, most of which will be invested in Central and Eastern Europe. — We need to enhance cooperation among SMEs. “16+1” cooperation, while encouraging the leading role of large enterprises, should also give full play to the supporting role of SMEs. Hence enterprises of all sizes will be able to forge synergy and grow together. On the sidelines of this Forum, the China-CEEC SMEs Matchmaking Event 2017 will be held, with the participation of around 400 companies. We will set up more cooperation mechanisms and service platforms, and promote the early establishment of a “16+1” SMEs Center to help SMEs to trade with each other and identify cooperation projects. Let me now give you an update on the development of the Chinese economy as I assume this would be a topic of interest to many of you. In recent years, China has been confronted with a complex international environment and continued downward pressure on its economy. Yet instead of resorting to massive stimulus, we have focused on supply-side structural reform and explored innovative ways for macro economic regulation to energize the market and social creativity. Through painstaking efforts, China has embarked on a track of innovation-driven development featuring mutually reinforcing progress between steady growth and structural upgrading as well as faster transformation in the drivers of growth. From 2013 to 2016, China’s economy grew at an average annual rate of 7.2 percent, contributing 30 percent to the world economic growth. 52.6 million jobs have been created in urban areas and 55.6 million people have been lifted out of poverty. This has been possible largely due to the vital support by the booming new growth drivers. New market players are emerging in large numbers. In the past three years, an average of 14,000 new companies got registered every day. New industries, new businesses and new models are being created. The digital economy is prospering. Online retail sales have maintained a high growth rate of around 30 percent. More than 500 million people now use mobile payment, and almost all daily payments in cities can be done through QR code scanning. Green economy is flourishing. Take renewable energy as an example, about 40 percent of the world’s newly installed capacity last year came from China. Sharing economy is fast expanding. Bike sharing, which was non-existent only two or three years ago, has become a thriving business. As of today, over 18 million bikes have hit the road in Chinese cities and they have now been introduced to other countries. At the same time, thanks to the development of the internet, traditional industries are being upgraded at a faster pace. With revolutionary changes in their organizational structure, R&D mechanism, production model and supply chain, these industries are brimming with new vigor. New growth drivers, which now contribute more than 30 percent of GDP growth and generate 70 percent of new urban jobs, are providing an increasingly important underpinning for the economy. This year, China’s economy has maintained steady progress and delivered a better-than-expected performance. First, macroeconomic indicators are generally sound. In the first three quarters, GDP grew by 6.9 percent, up by 0.2 percentage point year on year. Surveyed unemployment rate in major cities was the lowest in several years. From January to October, consumer prices were up by a moderate 1.5 percent. Import and export reversed the downward trajectory of the past two years. Foreign exchange reserves have been increasing. Second, the speed and quality of growth are more balanced. 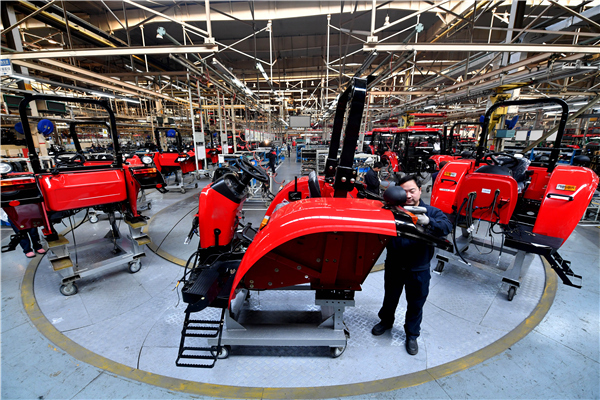 Despite measures adopted this year to cut tax burdens for companies totaling as much as one trillion yuan, fiscal revenue increased by 9.2 percent in the first ten months. The profits of large industrial enterprises soared by over 20 percent. Growth of personal incomes continues to outpace GDP growth. Third, growth has become more sustainable. In the first three quarters, final consumption contributed 64.5 percent of economic growth, more than any other factor. The services sector, which now accounts for 52.9 percent of GDP, takes up more than half of the economy. The bond market, stock market and housing sector have been generally stable. Corporate leverage ratio and NPL ratio of commercial banks have stabilized and shown signs of moderate decline. The RMB exchange rate has remained basically stable. Fiscal and financial risks are by and large under control. Market confidence is building up. Since the beginning of this year, leading international institutions have repeatedly adjusted upward their growth forecasts of the Chinese economy, which is a vote of confidence for China’s economic prospects. The 19th National Congress of the Communist Party of China held last month formulated the blueprint and program of action for China’s future development. The Chinese economy has been transitioning from a phase of rapid growth to a stage of high-quality development. We will implement the vision of innovative, coordinated, green, open and shared development, put quality first and give priority to performance, pursue supply-side structural reform as our main task, and work hard to transform the Chinese economy into one of better quality and higher efficiency which is spurred by more robust growth drivers. To this end, we will steadily strengthen our innovation capacity and economic competitiveness and build a modernized economic system. We will remain committed to the basic state policy of opening up, pursue the Belt and Road Initiative as a priority, and give equal emphasis to bringing in foreign investment and making outbound investment. At the same time, we will adopt policies to promote high-standard liberalization and facilitation of trade and investment, significantly ease market access, develop new ways of investing overseas, and form globally-oriented networks of trade, investment and financing, production, and services. All these will help usher in a new phase of all-round opening up for China. At this stage of high-quality development, China’s economy will be driven more by innovation; the consumption and industrial structures will be upgraded faster; and development will be more coordinated between rural and urban areas and among different regions. This means more open markets and greater growth, investment and cooperation opportunities for countries in the CEE region and other parts of the world. In the next 15 years, China is expected to import $24 trillion worth of goods, attract $2 trillion of overseas direct investment, and make $2 trillion of outbound investment and 2 billion outbound tourist visits. I believe that far-sighted and ambitious companies of all countries will make full use of the China-CEEC cooperation platform to get on board the express train of China’s development and share in the benefits of growth.